ADORED VINTAGE: The Adorevintage "Closet"
If you were ever curious about what the AV Closet looks like, here's a sneak peek. The other side has more racks and a couple dressers. On any given day of the week, the office is bursting with vintage! Funny story about the "wardrobe". Originally I had only purchased two thinking two was plenty enough... well once they were assembled and clothes were hung I realized I probably need THREE more to hang up all the stock we receive. It's a little cramped in here... but I'm happy with it. Who wouldn't be happy being surrounded by pretty things all day? So there it is! 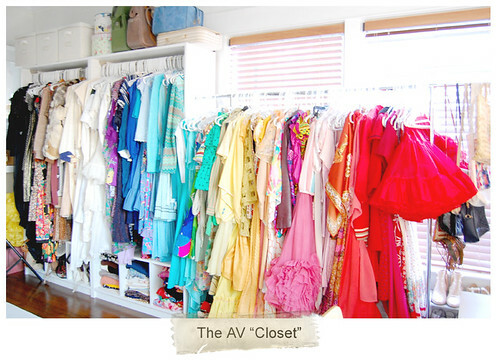 The AV closet, or atleast a little peek inside of it. This is where the lovely vintage in the shop sits and waits patiently to (hopefully) someday be a part of your closet. It's so lovely...like a dream! Pretty, colorful dresses, a nice big desk, and a great computer with a large monitor. 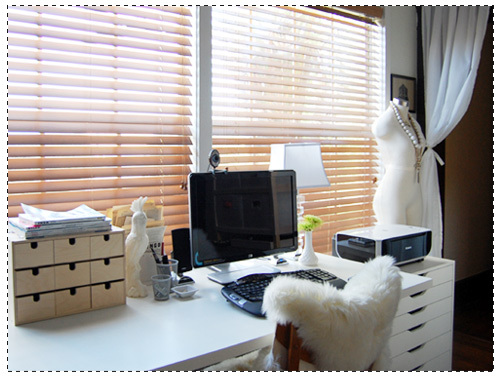 My fantasy workspace! Gorgeous! I love the desk area. Nice desktop I wish my room is like that.